Hard chrome: Hardnens is more than 1000 Hv. Brand: HIWIN, ABBA, CPC, IGUS, IKO, INA, MISUMI, NSK, NTN-SNR, PMI, BOSCH REXROTH, ROLLON, SKF, TBI, THK. 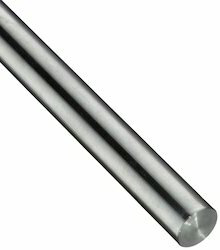 We design Hardened & Ground Chrome Plated Shaft to meet your specific needs for piston rod material in hydraulic and pneumatic cylinders and other applications. We are offering Chrome Shaft to our client. - Length: As per customer requirement. - Tolerance: As per customer requirement. We are dedicatedly involved in providing an excellent quality array of Hydraulic Chrome Plated Shaft, for catering the various needs of our clients. We are offering Chrome Plated Shaft to our client. We are one of the leading organization engaged in providing excellent quality Hard Chrome Fixed Shaft Rolls, which are manufactured by using high grade material. 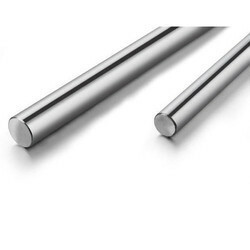 We design Hard Chrome Plated Burnish Shaft (hard chrome plated steel bars); to meet your specific needs for piston rod material in hydraulic and pneumatic cylinders and other applications. We use advanced techniques of surface removal, polishing and hard chrome plating for manufacturing the above bars. We manufacture an ample range of Hard Chrome Plated shafts, which are known for their precision design. These are widely used in automotive industries. We maily offer our products in kerala, Karnataka, Tamilnadu & Andhra Pradesh. We are specialized in shaft and linear bearings one of the best brand QLH, with housing and bearing stand. We have varieties with wel known brand and reliable quality products in shafts with a full range in various size and accurate cutting efficiency.its available in 1-6 mtr length and being used and approved by namy OEMS, now available in MUMBAI, AHMEDABAD AND RAJKOT.